WebMetro, a southern California SEO company, sought out etainia for a creative animation project for their Buffalo, New York based client, Uncle Bob’s Self Storage. 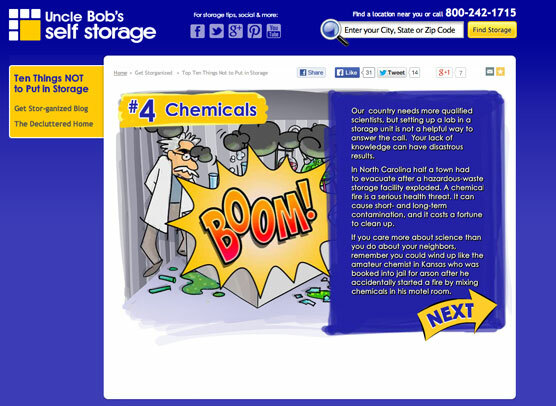 A fun and entertaining “Top Ten Things NOT To Put In Storage”, was the concept presented to us and we helped WebMetro create a storyboard that would be easy-to-use, fun, informative and drive conversion. In addition to using this interactive piece on the company’s website, it was also converted to a video for use in other online marketing channels. Once the storyboards were completed and approved, etainia collaborated with the illustrator so that the layouts and artwork would be clear and functional and allow for some simple animation effects. The opening is just that, “Uncle Bob” rolls up the storage rooms door to reveal the first item NOT to put in storage, then the user clicks to advance to through the remaining items.